By the turn of the twentieth century, bookmaking had become both inexpensive and common. Offset printing meant that books could be manufactured in bulk, and most publishers had abandoned hand binding, opting instead for cheap adhesive or staples. Enter William Morris, an Englishman who sought to recapture the beauty of handmade books. Morris established the Kelmscott Press in his home, Kelmscott manor, in 1891. His goal was to recapture the golden age of bookmaking, and Morris sought to maintain the artistry once found in medieval texts and manuscripts. One of the first books he created was the Kelmscott Chaucer. Others soon emulated his work, and fine presses began popping up both in Britain and in the U.S. Though fine press publishing efforts took a dip in the 1930s (considered too expensive for the Depression), the industry has enjoyed a resurgence and continues to thrive. 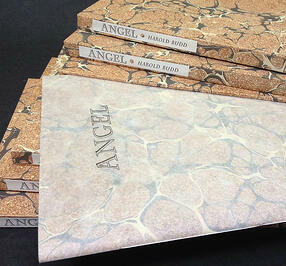 Fine press books are generally made in very small numbers, using high quality materials. Paper is often handmade, and the bindings are done by hand as well. Fine press books showcase not only illustrations, but also ornate fonts and other decorative touches. Different techniques such as painting or woodblocks may be used to create the illustrations. Books are printed using the letterpress technique. This method was introduced by Gutenberg, who first used it to print the now-famous Gutenberg Bible. The printer places movable type into a bed and locks it. Then ink is rolled over the type, and the page is either rolled or pressed against the inked surface. The raised letters leave imprints on the page. Usually the author, illustrator, and printer collaborate very closely on every aspect of a fine press book. Although a good number of fine press books are actually about the art of fine press and book making. A recent example is Labour Vertue Glorie: Leaves from the Emblem Books of Gabriel Rollenhagen & George Wither, published by Heavenly Monkey in 2018. As Rollin Milroy states in reference to the book, "The focus of L-V-G (the title is taken from Wither, Book 1, emblem V), however, is not the content or interpretations of the two authors’ emblems, but the production and form of the books from which these sample leaves come." Many fine press books go beyond mere literature and present wonderful pieces of art. As with any type of book collecting, collect what you like and buy the best you can afford. Some collectors suffer a bit of sticker shock when they venture into fine press. But remember that all these books are made by hand out of the finest materials. The craftsmanship is what gives fine press books their extraordinary value. You may want to focus your collection around one author, such as Charles van Sandwyk or Harold Budd. Consider collecting a specific genre, like poetry or even books about book making. Choose a specific style or technique you love, and look for fine press books that use that technique. What attracts you to fine press books? And if you could own an edition of any fine press book, what would you choose?